ALBANY – Virginia J. Straight DiMura 90, of Albany, died peacefully on Saturday, April 11, 2015 with her children by her side. She was the daughter of the late Charles W. Straight and Nicolina (Straight) Lostritto, and was predeceased by her husband of 61 years, Salvatore. She was the beloved and cherished mother to MaryJean (George) Scott and Joseph G. DiMura of Voorheesville; grandmother to Christopher DiMura, David (Theresa) Scott of Clifton Park, and Joseph Scott of Averill Park. She is also survived by great grandchildren, sisters-in-law, brothers-in-law, many nieces, nephews, cousins, dear friends and neighbors. She was predeceased by her brother Francis A.Straight, Sr.
Virgina will always be remembered as a loving daughter, sister, wife, mother, grandmother, great grandmother “GiGi” and as a devoted friend. At this time the family would like to give a personal thank you to the A1 Staff at Van Rensselaer Manor for their dedication, love, and compassion. A Mass of Christian Burial will be celebrated Wednesday morning at 9:00 am in All Saints Catholic Church, 16 Homestead St. (behind CVS) at 9:00. Relatives and friends are invited. There will be no calling hours. Entombment will follow the mass in St. Agnes Cemetery, Menands. In lieu of flowers, memorial contributions may be made to St. Jude Children’s Research Hospital, 501 St. Jude Place, Memphis, TN 38105, or to Fisher House, 113 Holland Ave, Albany, NY 12208. To leave a message of condolence for the family or obtain directions to the funeral home, please visit www.HansFuneralHome.com. Sorry to hear about Ginny. She was such a lovely person. Our condolences to all. 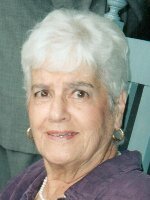 DiMura Family: Please accept my condolences on the loss of your dear mother Virginia. I have fond memories of her from years ago and remember “our little talks and laughs over the backyard fence.” May all of your wonderful memories sustain you at this difficult time. God Bless You, Virginia, Rest in Peace. My condolences to the Dimura family.Virginia was a warm hearted,caring, sincere neighbor and friend.She will be missed by all of the Commisso family. We were sorry to hear about Aunt Virginia’s passing. Although we haven’t seen her in many years, she was a great lady. May she rest in peace. I am very sorry to hear of Virginia’s passing. She was a very nice lady and I enjoyed the time I spent with her when visiting my Mother-In-Law Norma VanVranken at Van Rensselaer Manor. I know she will be missed very much by her family, and it is nice that I got to meet some of you because of her. To Joe and Mary I’m sorry for the loss that you have suffered. You both are in my prayers. Maryjean and Joe, I am so sorry to hear of your mother’s passing. She and I talked on the phone periodically. and humor that was unending!!! God bless Virginia, and may she rest in peace.